Angel- Deceased spirits that are rebirthed into the upper part spirit world as the spirits of pure hearts. Though their appearance may give one the appeal that these beings are 100% harmless beings, there are a lot more that meets the eye that happens behind closed doors as well. 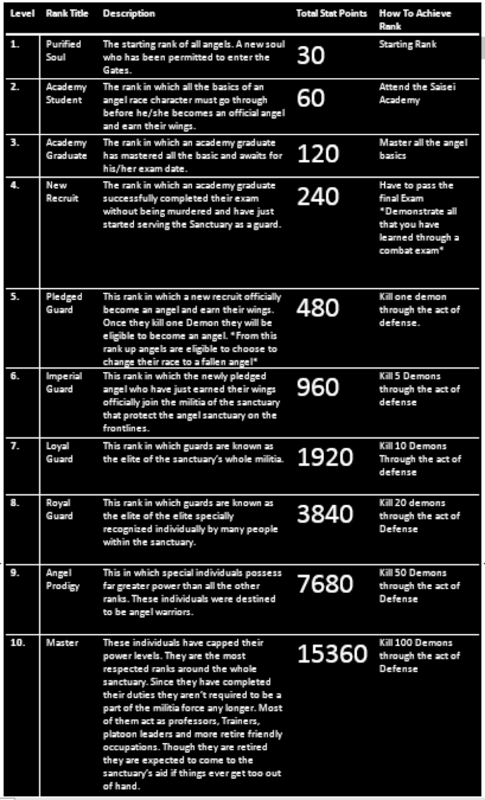 The angels are known for their defensive skills since they have to constantly defend the sanctuary from loose demons making their ranking system a bit complex since itâ€™s based on the number of demons they have slayed. 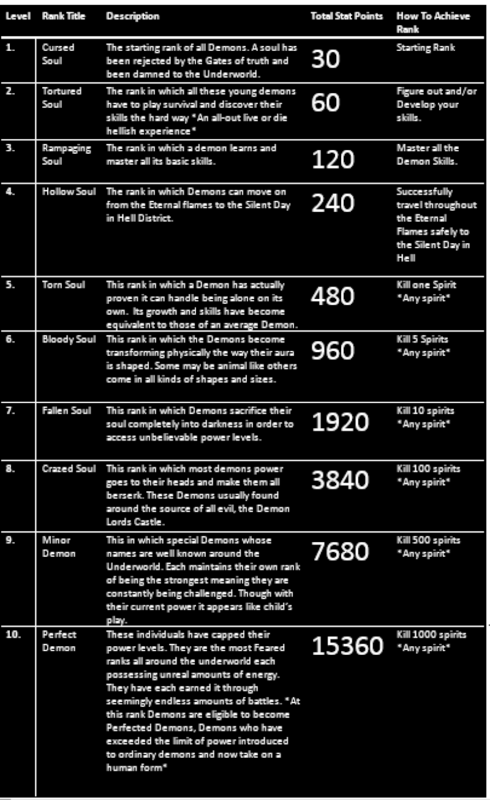 Ranking up as an angel could be rather short or extremely long depending on the next demon attacking on the sanctuary. The angels are beings in which that seek peace and defend, their nature is to wait and protect not seek out a foe and slay. There are consequences for those who break these rules which will be provided further down as you carry on reading. Demon- Deceased spirits that are rebirthed into the lower part of the spirit world as the cursed spirits. These beings come in many shapes and sizes each containing a unique trait of their own. Some are extremely powerful, some are extremely weak, some are highly intelligent, and others lack the ability of intelligence to the point where they cannot comprehend or even provide some kind of speaking skills. Though all these beings are unique they all have that one killer instinct to kill anything and anyone within their path even if they are another demon. 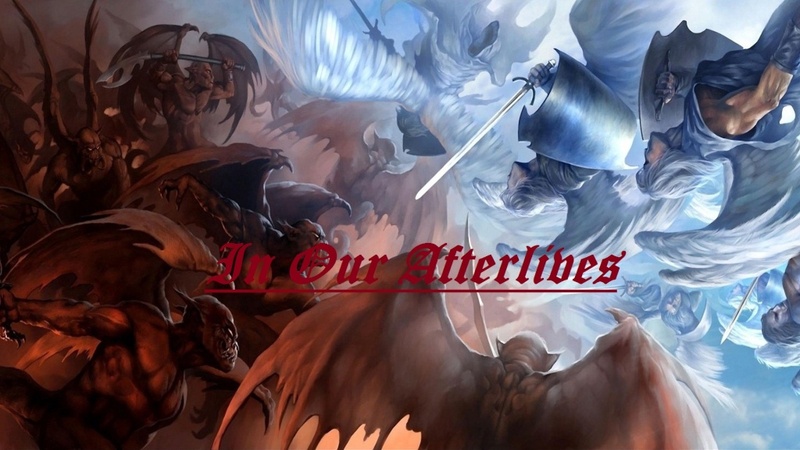 They all fight in a never ending war in the flames of the underworld, occasionally some may escape through the giant hole in the underworld called the path of freedom, seeking out many ways to get stronger by killing off other beings. The Demons are known for their Spiritual Aura (Basically their spirit energy or somewhat their chakra) skills. Since this race is based on this skill, the ranking system is simple. This race is simply gladiators, kill and gain exp. Vampire- As this race, you can choose to start off as a vampire or become one by starting as a human. They are deceased spirits that are permitted to live within the world of the living and travel back and forth through the spirit world as well. This race may be either good or evil or even neutral, there isnâ€™t a specific guideline they must follow. They usually stay together in Clans (Families) and/or Covenants (Group). Though they may not appear as much of a threat within the spirit world as one being unless they are at a high rank or travel within some type of group, Just one within the human world can level up rather fast in the human world feeding off the blood of least expecting humans. This race is known for their Agility, Making kills and ranking up fast. Werewolf-Likewise with this race, you can start off as a werewolf or become one by starting as a human. They are deceased spirits that are permitted to live within the world of the living and travel back and forth through the spirit world as well. This race may be either good or evil or even neutral, there isnâ€™t a specific guideline they must follow. They usually stay together in Clans (Families) and/or Tribes/Packs (Group). This race can be rather annoying to face due to its tanker like stats. Leveling with the human world is also easy and quick for them. This race is known for their HP skills, making this race somewhat indestructible. Witch-As this race you may start off as a witch or a human whoâ€™s at a Wiccan status trying to become a full witch. These beings unlike all the others are actually living beings that can travel throughout the spirit world then back to the world of the living freely. This race can either good, evil, or neutral, there isnâ€™t a specific guideline they must follow. They all usually get together occasionally to either plot or train new recruits then attack in separate numbers. If they donâ€™t like each other or even have a war between another class of witches they still have to meet at the given location and set aside their differences every now and then. This race is hard to rank up but also has the potential to be one of the strongest races. They are the only race that gains XP points and an additional +5 for all of their stats each time they rank up. Though it is difficult for them to rank up due to all the other ranks quickly limiting all of the prey within the world. Fallen Angel- Deceased spirits that were once rebirthed into the gates of the sanctuary as angels but due to their intense crime against their own they have been stripped of their wings of light and banished to the world of the living. They apparently being banished and dashed to earth with such incredible speed, go through amnesia for a few weeks until they can fully remember their past. At that point they have access to their power again yet with a dark twist. They then may do as they please still possessing the skills they had from the academy and may potential pick up new, original ones they have on their own. This race is now known for Their Attack power as well as their agility, making this race seem almost indestructible. Immortal Beings- As this race, you must start off as a vampire. They are deceased spirits that are permitted to live within the world of the living and travel back and forth through the spirit world as well. This race may be either good or evil or even neutral, there isnâ€™t a specific guideline they must follow. They usually are the heads of their clans and/or covenants. They can be a huge threat within the spirit world as well as the human world. A low ranked one by his/her self can cause a lot of damage. This race use to be known for their Agility, Making kills and ranking up fast. But now, they are known for their agility and their HP stats, making this race seem almost indestructible. Lycan- Likewise with this race, you must start off as a werewolf. They are deceased spirits that are permitted to live within the world of the living and travel back and forth through the spirit world as well. This race may be either good or evil or even neutral, there isnâ€™t a specific guideline they must follow. They usually are the heads of their clans and/or covenants. This race use to be rather annoying to face due to its tanker like stats. Leveling with the human world is also easy and quick for them. This race is known for their HP skills, making this race somewhat indestructible. But now, they are known for their HP and their Attack stats, making this race seem almost indestructible. Imperfect Demon- Deceased spirits that are rebirthed demons that found a way to evolve into a human like form. Though they have completely changed shape all these beings are still unique, they all have that one killer instinct to kill anything and anyone within their path even if they are another demon. These demons now roam the world of the living freely, they canâ€™t told a difference between a normal human. The Demons use to be known for their Spiritual Aura (Basically their spirit energy or somewhat their chakra) skills. Since this race is based on this skill, the ranking system is simple. This race is simply gladiators, kill and gain exp. But now, they are known for their Spiritual Aura and their agility stats, making this race seem almost indestructible. Succubus/Incubus: A race in which you must start out as a witch. These crazed witches all develop themselves in a unique way focusing their attention on mastering and perfecting only two specific elements (fire, water, lightning, earth, etc., *free to make up your own or use more complex forms such as darkness, shadows, ash, etc. *) Each and every last one of their individual natures are unique. There are those who are blood thirst, those who are very calm and those who even do not have the will to fight. Previously witches were known for the gradual increase of all their stats, Succubus and Incubus will also have that same stat increase with the addition of Spiritual Aura increase making this race appear somewhat indestructible. Grim Reaper: A race in which any person must be reincarnated into. The nature of the grim reaper is to act as a neutral force making sure too much good or evil into the world is released though they also have the option to favor a side and do as they please. These powerful beings are found often roaming the Twilight Zone making sure no being that is considered a threat is within the area. This is simply so they he can allow the newly roaming spirits to wait in a safe environment until they either find their bodies or get scouted by an angel. Though this being maintains an extremely high amount of power, they cannot be in two places at once this is how some of the spirits end up becoming demons. This race unlike the others has no ranking system, just the title of Grim Reaper. They have a total of 61920 *Equivalent to two races* stat points immediately as they start this race. GOD: A race in which an eternal being must be. The nature of this race is also neutral, not allowed to take anyone’s side, just keep balance between them all. This being just usually stays within their thrown room within the shadow void watching down on the world only to step foot out of his castle if something catastrophic happens. This race also has no ranking system, just the title of GOD. They have a total of 92880 *Equivalent to three races* stat points immediately as they start this race.